Special needs: Trekking poles would be nice. Rockiest trail around here, but fun and not too popular! Why? : views, solitude, easy access. Click here for a series of photos from the Jackson Trail or here for an extended hike including the Deer Path. there were 6 of them catching the thermals that day." Under construction-someday I'll finish this! 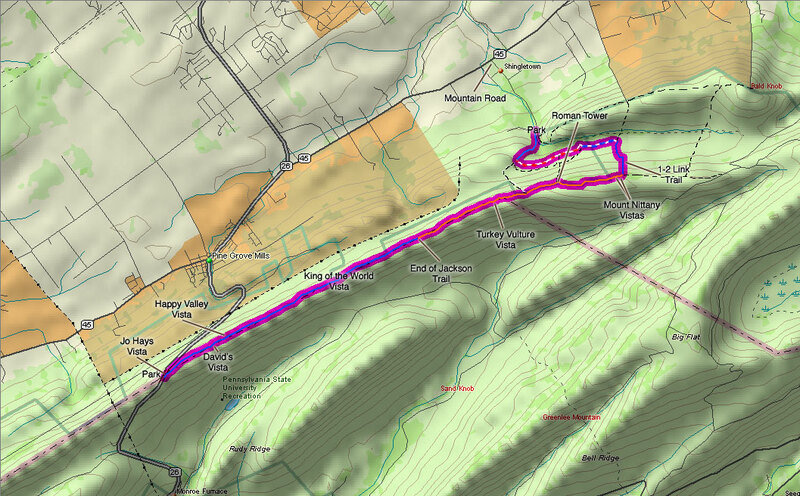 Read a little about the Jackson Trail in "Creating the Mid State Trail"
To begin the hike, take PA Route 26 (West College Ave. in State College) about 5 miles to the village of Pine Grove Mills. 26 makes a left turn at the blinking light in town, and climbs Tussey Ridge. 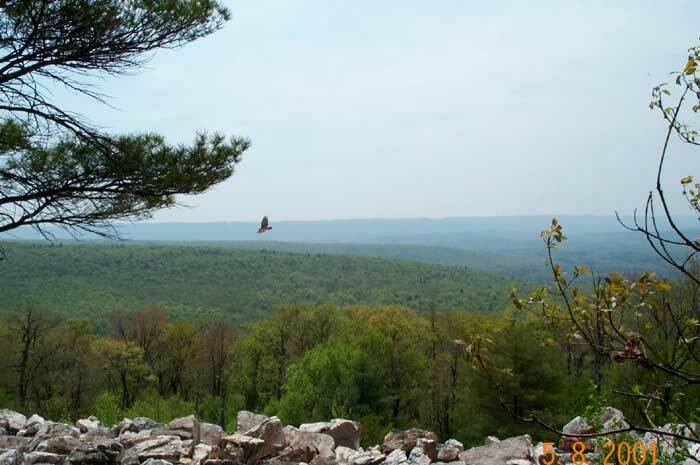 The locals call this Pine Grove Mountain, but it is really just Tussey Ridge. At the peak of the hill, you'll find a parking lot. This is Jo Hays Vista, named for a former State Senator, whose efforts led, amongst other things, to the creation of the site that bears his name. This is a relatively safe place to park, but be sure to lock things up. The view from Jo Hays vista is nice, so take it in before crossing the road to start your hike. This stretch of highway is traveled by a lot of commuters, and they like to go 60 miles an hour or more over the top of this hill, so be very careful crossing the road. This is one of my favorite hikes in the area, and it's easy to do as a shuttle. 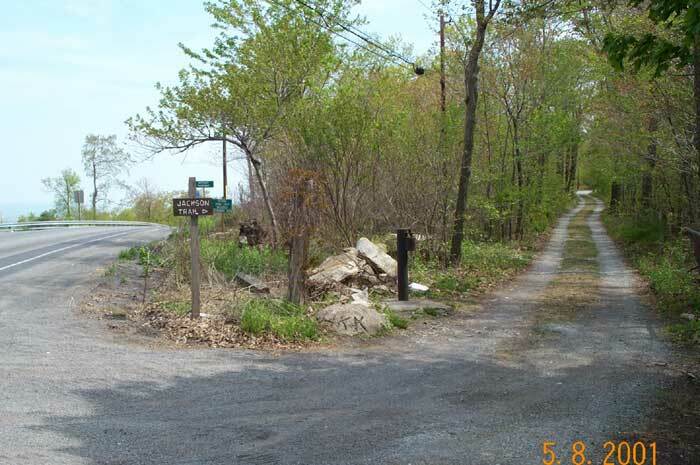 Park one car at Jo Hays Vista and one at Shingletown Gap (on Mountain Road, off RT45 South/West of Boalsburg, PA). Walk from one to the other, and you have your hike! If you need more help than that, feel free to email me at bill@billshikes.com. If you're comfortable with the area, just go ahead and do the hike. A Mid State Trail guide would be helpful, as well as the Mike Hermann map of the area, both available at Appalachian Outdoors. My online map is a bit old, and where it says to take the "1-2 Link", forget it. You can read why on my blog entry. In a nutshell, the trail has been abandoned, and although you can still start down its remnants, it's not worth the effort. It's steep and has a lot of loose rocks, then it disappears into a firefight of blazes, all blue. Sure, you can bushwhack to Shingletown Gap, but there's an easier way. Keep heading East (North on the MST guide) to the Sand Spring Trail, marked very well with a sturdy sign. Take it down to Shingletown Path, which is not well-marked, but rather well-used. If you have to ask yourself if you've found it, you haven't, but if you find yourself going uphill, you've gone too far. Hang a left on the Shingletown Path. Now, this dayhike will take a whole day, so prepare for that! Also, rattlesnakes have been seen in the area, so just tap around rocks before sitting down. Regarding these critters, I have never,personally, seen one, and I've hiked that section a dozen times, in all kinds of weather. I suspect that the pinging of my trekking poles scares them away. I've been told by respectable people that they will typically slither away, once they are aware of your presence. If you happen to sneak up on one or startle it, it'll rattle to let you know to back away. Just back away. The only people, it seems, that get bitten by snakes are the ones who try to pick them up. So, don't worry about the snakes. Simplyu put, even if you do get bitten—which is extremely rare—just keep calm, call 911 and walk out. There's excellent cell phone coverage on the hill, by the way.